I have tried loads of cushion-related cosmetics, but none enticed me as much as this! O’melon’s Chameleon Essence Queen CC Cushion is a 3-color base (beige-50%-, white-25%-, pink-25%-) CC Cushion equipped with a waterproof function completes three-dimensional and natural make-up. In addition, its vegetal cooling essence has a superior skin soothing effect and boast to help treat wrinkles while boosting elasticity. 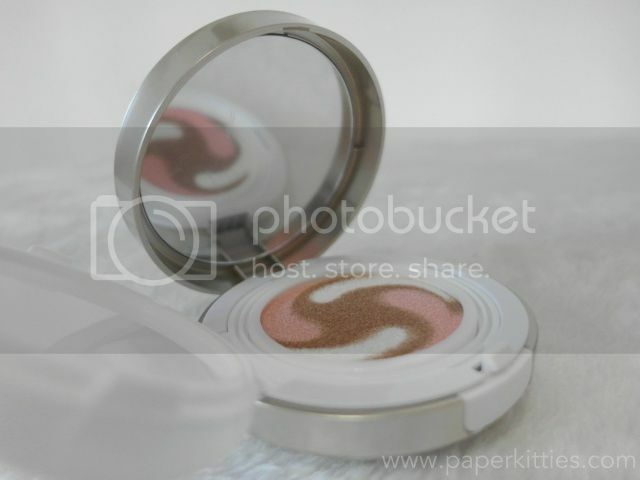 Beige: Covers dull tone, freckles, blemishes and pimples. White: Contains various plant extracts to help complete smooth and natural makeup and preserve it. Pink: Contains rose essence for a healthy and bright complexion. Before blending it, so pretty right?! I’m pretty impressed with the coverage and how the product actually does its work in concealing my flaws whilst promoting a healthy and radiant complexion. It doesn’t draw attention to dry patches as it is very hydrating, and gives off a dewy after-feel.